Name Meyer Fine Art Inc. 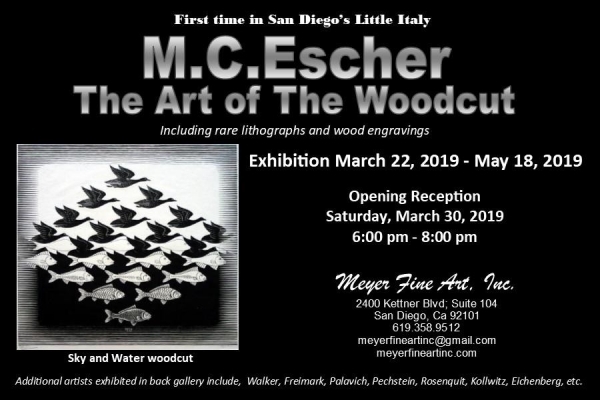 Event Description For the first time in San Diego’s Little Italy Meyer Fine Art, Inc. is exhibiting a stunning collection of original works by M.C. Escher, featuring rare, original woodcuts, including lithographs and wood engravings. The artwork will be available for acquisition March 22, 2019 – May 18, 2019. The reception for this exhibition is Saturday, March 30, 2019 6:00 - 8:00 p.m., at the gallery located in the dynamic Art & Design District in Little Italy North’s historical Studio Arts Building on Kettner Blvd. Meyer Fine Art will be showcasing over 40 original, mathematically-inspired woodcuts, including hard-to-find lithographs and wood engravings from the 1930-1950s. Some of the iconic artworks exhibited are \'Sky and Water\', \'Bond of Union\', diverse \'Emblemata\' images and several landscape pieces from Escher\'s stay in Italy. Additional artists exhibited in the back gallery include Walker, Freimark, Palavich, Pechstein, Rosenquit, Kollwitz, Eichenberg, and many more.